Author(s): Michael E. Thase, Department of Psychiatry, Perelman School of Medicine, University of Pennsylvania, 3535 Market Street, Philadelphia, PA 19104, USA. Peter Zhang, Aleksandar Skuban, Mary Hobart, Catherine Weiss, Emmanuelle Weiller, James C. Nelson. 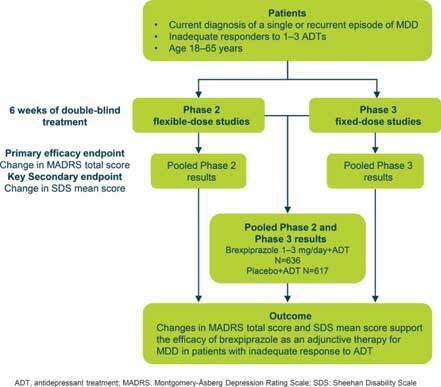 Objective: To summarize efficacy data from two phase 2 and two phase 3 short-term, multicenter, randomized, double-blind, placebo-controlled studies of brexpiprazole adjunctive to antidepressant treatments (ADTs) in patients with major depressive disorder (MDD) with inadequate response to ADTs. Methods: Patients with MDD who were inadequate responders to 1–3 prior ADTs entered an 8-week single-blind prospective treatment phase on physician-determined ADT. Patients with inadequate response throughout the prospective treatment phase were randomized to receive either placebo or brexpiprazole (phase 2: flexible dosage 0.15–3.0 mg/day; phase 3: fixed-dosages 1, 2, or 3 mg/day) as adjunctive treatment to their ADT. The primary endpoint was change in Montgomery-Åsberg Depression Rating Scale (MADRS) total score from baseline to week 6. Results: Phase 2 studies suggested brexpiprazole doses of 1–3 mg/day were effective as an adjunctive therapy. These observations were confirmed across the two phase 3 studies utilizing a pooled placebo group versus brexpiprazole 1, 2, and 3 mg/day and a pooled analysis of all four studies (brexpiprazole 1–3 mg/day). Greater improvements were observed in MADRS total score with brexpiprazole+ADT versus placebo+ADT (1 mg/day, p<0.01; 2 mg/day, p<0.01; 3 mg/day, p<0.001; brexpiprazole 1–3 mg/day, p<0.0001). Conclusion: Adjunctive brexpiprazole is an efficacious treatment option for patients with MDD and inadequate response to ADT. ClinicalTrials.gov: NCT00797966; NCT01052077; NCT01360632; NCT01360645. Keywords: Adjunctive therapy, antipsychotics, brexpiprazole, efficacy, major depressive disorder. Affiliation:Department of Psychiatry, Perelman School of Medicine, University of Pennsylvania, 3535 Market Street, Philadelphia, PA 19104, USA. Keywords:Adjunctive therapy, antipsychotics, brexpiprazole, efficacy, major depressive disorder. Abstract:Objective: To summarize efficacy data from two phase 2 and two phase 3 short-term, multicenter, randomized, double-blind, placebo-controlled studies of brexpiprazole adjunctive to antidepressant treatments (ADTs) in patients with major depressive disorder (MDD) with inadequate response to ADTs.